It’s very simple to make a low-calorie lunch when using Konjac Noodles, with only 10 calories per 125g. They have a unique texture, similar to rice noodles. I find they are best eaten with Asian style flavors . This dish comes in under 150 calories, low carb, low-fat,high fibre and great source of protein. I created this recipe as I’ve been doing the 5:2 diet, it’s a great lunch or dinner option. To serve fresh coriander, Thai basil and shredded kaffir lime leaves. Place all the broth ingredients into a sauce pan, bring to the boil and add the chicken breast, simmer for 5 minutes and turn the heat off and place lid on, leave for 10 minutes. Remove the chicken from broth and strain liquid, place the broth back onto low heat with the broccolini and pak choy, simmer until done to your liking. The veggies will absorb some of the broth, so you can add more water if you wish. 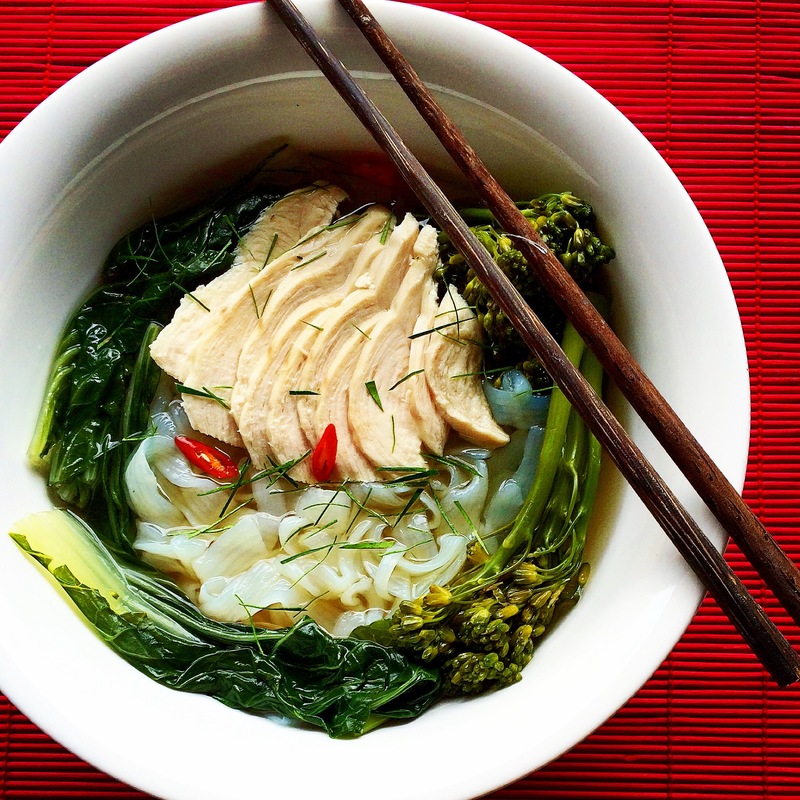 Place the sliced or shredded chicken, konjac noodles and sauce ingredients into the broth, cook until heated through. Serve with fresh coriander, Thai basil and kaffir lime. *all these items are stored in my freezer.